Each year, the Alumni Association Scholarship program helps amazing students succeed at UMBC. Over the next few weeks, we’ll be sharing some of their stories with you. 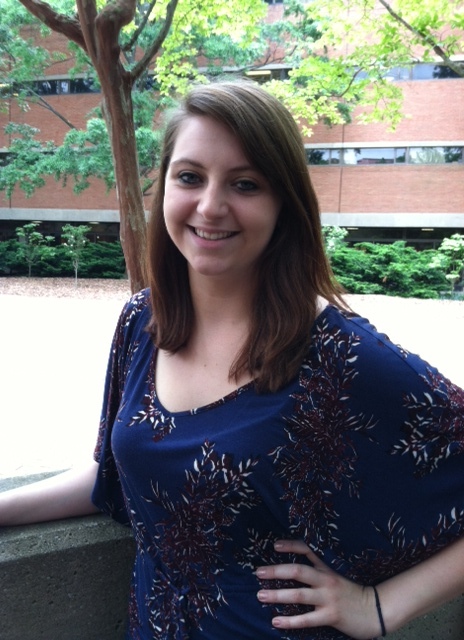 This week, meet scholarship recipient Paige Khoury ’12. When you meet Paige Khoury ’12, dance, it’s easy to see why the new grad has trouble sitting still. Not only does she dance and choreograph, she’s also a dedicated volunteer – and even, recently, a budding filmmaker. As one of four Alumni Association Scholarship winners for the 2011-2012 school year, Paige puts her passions to work wherever she goes, and UMBC is all the better for it. From “Catalyst.” Click to enlarge. While dancing takes up a lot of her time, Khoury also truly enjoys giving back through volunteer work. She spent a month in Haiti during the summer of 2010 helping earthquake victims rebuild their lives. The volunteering – which she completed as a part of her church’s mission work – shaped her world outlook, she says. “We helped out at an orphanage with 50 children in it that was run by one woman all by herself,” she says, showing off a bracelet given to her by a little boy named Albert, who latched onto her her first day in the torn country. Newly graduated, Khoury is taking some time to figure out what she wants to do long term. She knows she wants to help people. She wants to dance. Perhaps she could combine the two somehow, she says. Ever grateful for the chances her scholarships gave her (she also earned a partial Linehan Artists Scholarship for dance), she also hopes to stay involved with UMBC. – As a sort of going away present to the Class of 2012, Paige orchestrated (and choreographed!) a video “lip dub” entitled “Study Rock Anthem” (to the tune of “Party Rock Anthem” by LMFAO). Watch it here.